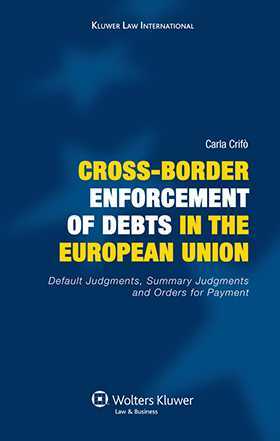 application, service and enforcement of a European Order for Payment. In the context of the intense academic and practical debate around what is being called ‘European civil procedure,’ this book contributes signally to the Commission’s stated objective of ensuring ‘as globally as possible a swift, efficient and inexpensive access to justice.’ The author details the procedural measures prescribed by the relevant directives (and their case law so far), and incidentally provides a convenient conduit to the appropriate material on the websites of the European Judicial Network and the Judicial Atlas in each jurisdiction. As lawyers continue, in the absence of ‘mutual trust’, to apply their own historic and philosophical meaning to the ‘harmonized’ procedures – no matter how much this approach is discouraged in the preambles to the regulations and directives – this book greatly illuminates the way forward in a difficult but extremely important area of European law. Introduction. Part One. 1. Setting the Stage for a European Law of Civil Procedure. 2. The European Enforcement Order for Uncontested Claims. 3. The European Order for Payment. Part Two. 4. England and Wales. 5. Germany. 6. France. 7. Italy. 8. Spain. Appendices. Table of References. List of Cases Cited. Bibliography. Index.